Some change will come slowly, doled out in measured bits to avoid shaking the trees of existing markets too aggressively. Other changes will be fast, some driven by startups able to move with bolder strokes than their public company rivals who are beholden to stock market investors. Step by step, level by level, the changes are coming. Some are here now. Powered by microprocessors, in the late 70’s and early 80’s the home video game industry was born. With it, a pattern emerged. Every handful of years hardware manufacturers would duke it out with a next generation hardware platform filled out with the latest and greatest of the era’s technology. Faster processors, more memory and better graphics, all powering faster, richer game play. It started with Silicon Valley rivals, Fairchild and Atari&nbsp; (Fairchild made the first home console but Atari won the first “console war”). Atari gave way to Nintendo, Sega, and eventually, Microsoft and Sony joined the mix too. As technology miniaturized, portables joined the fray on a similar (though less grand) trajectory but the “console cycle” defined things and set the pace. Paralleling the hardware market, both feeding its cycle and fueling it, the game software industry came to life. Arcade titles were licensed for repackaging on home platforms. Even movie titles were lined up as potential franchises. (Atari licensed the rights to make a game based on “E.T. The Extra Terrestrial” in 1982). In the beginning, hardware makes held the advantage because they knew how to code for their own systems. In 1979, a bunch of Atari programmers banded together to start their own software development company. They called it Activision. Third party publishing began. Over the next twenty to twenty five years, the overall game industry matured but its market dynamics stayed more or less unchanged. The Video Game Industry became the “Interactive Entertainment Industry,” millions turned into billions but console cycles came and went. Developers still ported their titles from one generation to the next. Publishers courted and cultivated retail relations. And consumers still did their shopping at retail. (Retailers were so important to making the market in the early days, Atari went so far as to sign an OEM agreement with Sears that allowed the company to sell the 2600 and its games under Sear’s own Tele Games brand). For decades the patterns and players were mostly consistent. Our current generation of hardware changed that. Like every other entertainment and media industry, when technology advances brought connectivity (aka the Internet) to the current generation of gaming devices, it was a game changer; here, literally. In the Interactive Entertainment Business, for the first time, manufacturers were teased with the promise of an environment where they’d eventually be able to sell directly to consumers. On offer were higher margins and extended shelf life. Fewer middlemen. 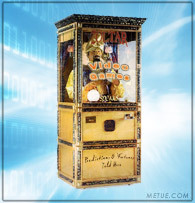 Connectivity also delivered the tools necessary to give players the benefits of PC gaming (upload/download, remote social interaction, game upgrades) with the graphic engines, controls and “sit back/ lay back on the couch” environment that made console gaming the industry’s headlining star. So far with connected environments, however, a lot of potential innovation is on order but not yet delivered. Financial imperatives are pushing evolution but they are also holding it back. Prior to the internet generation, publishers and retailers existed in an environment of mutual need. Gamers needed retail’s distribution. Retail needed games’ revenue. It was symbiotic and mutually protected. (It’s probably not a coincidence, for example, that most major retailers didn’t get involved in used game sales, a market that cuts out manufacturers. You don’t bite the hand that feeds you). Today, however, game publishers need more. In today’s world, console games can take tens of millions of dollars and several years to develop. In addition to general development expense, they carry costs for outsourced art, voice licensing and more. When it comes time for sales, a title has a limited shelf life, maybe a few years, sometimes only months. During that window, developers need to recoup the millions of expense. That equation (high cost, short life), similar to the movie industry, creates financial imperatives for supporting “tent poles” – the sure thing sequels. It’s an environment where studios consistently redeploy known brands because they’re the only commodity that can provide relative insurance of a secure income. Creativity and innovation become sacrificial to bottom line needs. The business models of download-driven gaming offer an alternative but getting there rapidly poses a challenge: If a company embraces tomorrow’s revenue streams too aggressively, they threaten today’s income. If they protect today’s income too securely, they slow the pace of advancement. The situation is like an old parable: A parched city needs water. Its own supplies are limited. An answer lies in a lake on the other side of a barren desert but to be the city’s salvation, engineers need to first figure out how to reach the lake and then bring its bounty back. For the lake to matter, the city’s people need to have enough water to reach it in the first place. They also need to have enough to sustain the effort of building an aqueduct to bring water back in unlimited supply. It’s a challenge of balancing resources. This “aqueduct scenario” is a struggle being confronted by many of the gaming industries biggest names. In today’s environment, companies are balancing today’s revenue against tomorrow’s. Pragmatism can lead to innovation being corralled and then doled out slowly, or even stifled. At one extreme, there’s downloadable content. Things like track packs in a music game, or episodic add-ons for a first-person shooter. Impossible on prior generation consoles, now, an initial purchase can be stretched through the Internet pipeline. With an expansion, a game can run a little bit longer and present some new challenges. The initial sale still happens at retail but for publishers there is a tool to draw out revenue beyond it. Downloadable content extends the tail. In a Time magazine column published a few years back, Steven Van Zandt, the guitar player in Bruce Springsteen’s E Street Band proclaimed, “The record business is over!” Changes in radio play and fan interest, mixed with the general digitalizing of the music business put the writing on the wall. Hope for classic rock? That, Van Zandt suggested, was video games. “The video games Guitar Hero and now Rock Band, may have saved classic rock for generations to come,” he wrote. Not only were the games introducing bands to new audiences and different demographics, they were selling the tunes via downloads. Between launch and February of 2009, Rock Band as just one example, sold 40m downloadable song tracks. Guitar Hero, as of last spring, had pushed out upwards of 34 million. A second example of download-driven gaming’s staged evolution is a genre called: dynamic games. Traditionally, games were static. They were coded once, put on a disc or cartridge and sold as is. Dynamic Games, made possible with connected consoles, are games endowed with the ability to expand, or evolve, over time; games with the ability to change from one playing experience to the next. Imagine a baseball title, it’s October and the Yankees and Red Sox are playing for the American League pennant. When you boot up your video game, it queries a sports database and downloads the latest stats. Jeter’s having a bad year and only batting .240? And only .170 since September? With the “reality setting” chosen his virtual character’s batting abilities will simultaneously be dropped in your game to replicate the real world data. Josh Beckett’s leading the majors in ERA? Undefeated in starts since August? With the “reality” option checked, his fastball may approach unhittable. In 2007, one of the first commercial demonstrations of this was a barely publicized experiment from Electronic Arts. The company linked up with the Weather Channel to allow real world weather to trigger the weather displayed in its NCAA football title. A year later, EA upped the ante and put the same concepts to work in a second generation offering. The evolution addressed the difficulty levels (player skill levels) in a sports game and made them dynamically configurable from real time information (much like the fictional baseball example). More examples of dynamic gaming will come to gaming’s other genres. There might be new characters dynamically piped into role playing titles, or new missions and geographies incrementally added to augment the playing environment of a “first person shooter.” The possibilities are infinite. One of the answers may come from startups. Young companies can often try things their larger rivals cannot. When it comes to game consoles, stories usually center on the couple devices that define the current generation of hardware or delve into rumors of what’s coming next. Usually we talk about an individual platform; the console’s power, the integrated electronics it houses, the engines” and their potential. Announced to big buzz and comparable skepticism last spring, the company has lured 9 game publishers and major investors into backing its vision. A Series C financing announced in late September on the company’s blog is rumored to have closed at a valuation upwards of $500m, a near record for a pre-revenue company if true. To achieve its vision, OnLive developed unique compression technology and rethought some of the quality control systems used to handle video streaming online. Currently in beta, it’s unclear how the company will be received by the consumer market. Data compression can only take things so far. There are potential issues of latency and lag. Success depends in part on an Internet pipe that can handle the load. OnLive says it will take a 1.5mb connection to play a standard definition game. An HD title will need 5mb. Not every broadband subscriber will have the capacity. OnLive’s success is also going to require high quality games, and a leap of faith on the part of consumers – trust in network consistency and comfort with a system dependent on someone else’s resources (notably OnLive’s servers and the ISP’s network etc). There’s a very real possibility in the face of the challenges that OnLive could be a few years ahead of its time. Still, the company is pushing boundaries. Publishers, in particular, seem to love the idea for one simple fact: OnLive can do several things they can’t. For one: server side software is almost impossible to pirate because it’s never loose in the wild. Piracy, be gone. Another benefit is cost. Porting a game to a single server-side platform promises to be both easier and cheaper than working to deliver a game to multiple different hardware profiles, each of which has its own unique coding requirements. As a platform, OnLive also addresses the aqueduct scenario. 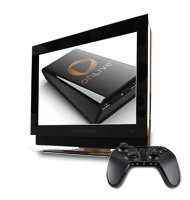 With OnLive’s streamed gaming solution, publishers can offer games outside of traditional retail. They can embrace the potential of dynamic games and downloadable content however they see fit. And so long as OnLive reaches the market during the already supported console cycle (as planned), the risk of retail cannibalization is measured. With OnLive, THQ, EA or Ubisoft can each experiment with installment, subscription, or even pay-per-play models. Consoles, consoles, consoles. With all the talk, it sometimes seems like the three boxes (Wii, Xbox and PS3) define the entire gaming space. Of course, there’s a lot more out there … casual games, PC games, portables, MMOG’s, and definitely, mobile games. Just a few years ago, mobile gaming was not much more than lightweight entertainment on underpowered devices. The genre was a novelty. Now, though, you can’t talk about gaming’s future without mention of mobile platforms. Much as Internet connectivity unlocks new avenues for consoles, the power, portability and cellular (or WiFi) connections on today’s phones creates entirely new opportunity too. Today’s phones are reinterpretting what video games can be. At the center of gaming’s mobile revolution, somewhat indirectly, is Apple. The iPhone (and iPod Touch) are revolutionary. But it’s not the phone service that makes the iPhone amazing or the musical abilities of the iPod Touch that make it spectacular. It’s the “Apps.” Like iTunes before it, Apple needed a hearty ecosystem of content to keep customers engaged and entwined. The company knew it needed something unique to make its offerings more than just pretty versions of the same devices competitors offered variations of. The App Store became the lure and customers bit down on it hard. On September 28th, Apple announced more than 2 billion applications had been downloaded. Over its short life, the store has pushed out an average of more than 4.5m downloads a day. 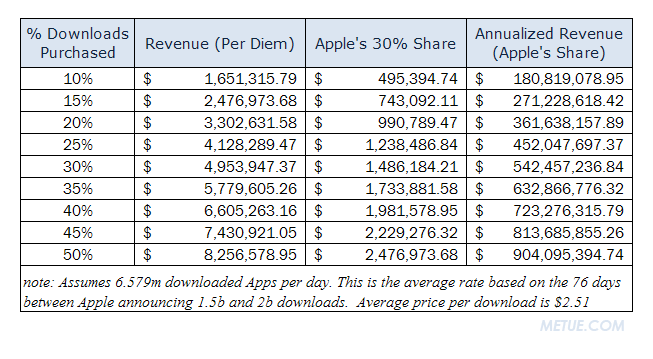 Revenue modeling hints the App Store could easily be turning more than $3 million a day. Not surprisingly, the majority of the titles driving demand are entertainment specific (books, entertainment and games). And among all categories, games have been the most popular. According to one list tracking the top all time apps (paid/free combined), all of the Top 100 apps were games. People are trying marketing promos, grabbing old standbys, program after program. Frogger to play on a train, Tetris to pass some time procrastinating. Solitaire for amusement. Customer’s can’t get enough. The thing is, many of the most popular titles are retakes on older hits, or variations of existing (and current) game concepts. Many are rapidly consumed – played for a bit, and forgotten. For all the innovation and potential of the platform, developers haven’t yet figured out how to leverage the iPhone’s fullest potential. In the future of gaming, that will change. 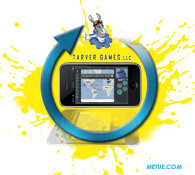 Tarver Games is a small IP development studio based in Southern California with only iPhone games on its public product roster (so far). At first glance, it would be easy to peg the seven person company as another player riding the waves at the iPhone’s periphery. Taking that view would be a mistake and shortsighted. Built from a team that includes staffers who cut their teeth at EA, Activision, Blizzard and DreamWorks Interactive, Tarver is not a garage shop looking to churn out simple, lightweight, game experiences. It’s also not a company with a single platform ambition. Like other veterans of the gaming industry, Tarver’s founders were aware of the market trends and they launched their company in reaction to them. To their eyes, the iPhone was a springboard. It represented a massive, low cost focus group. With the iPhone, Tarver’s developers can explore new storylines. They can test new ways to distribute games, even new ways to play them. With the iPhone, Tarver Games is looking to push boundaries. Tarver Games’ second game demonstrates Cross’ view in action. Revealed earlier this month and coming soon to the App Store, Ghosts Attack, is a first person shooter for the iPhone that integrates Google Maps to procedurally generate game levels. The story begins with seventeen linear missions but these are infinitely replayable in different locations around the world. Going forward, Tarver plans to support the game with evolving episodic updates and possible cross platform (Facebook, Twitter, web) integration. “The real goal is to get players to treat our game like a TV channel. Get them to come back on a daily basis looking for new content,” says Cross. In a way, that’s a view that goes back to an old entrepreneur’s mantra: To do something great you have to get out in front. It’s not enough to solve today’s problems. You have to anticipate tomorrow’s. Tarver is trying to do that with game design. They’re trying to find the potential in emerging platforms so they can push the boundaries of what a game can be. So back to the fortune telling and the predictions. Back to the big questions about where the gaming industry is headed? Back to gaming’s future….. Where are we going? Some answers are apparent. In measured steps the future is already here now in the broader entertainment offerings of Xbox Live, or the motion controls begun with the Wii and promised in Microsoft’s Project Natal. There’s evidence of gaming’s next generation in the success of downloadable expansions, in dynamic games, or in the mass adoption of the iPhone as an entertainment platform. Other answers to what comes next will surely be surprises. Maybe the future will be found in the download-driven focus of OnLive, maybe games will find new direction in the concepts being explored by companies like Tarver Games. Maybe, a new console cycle will begin five years from now and take us all by surprise. But wherever gaming going…. we’re on the way. The gaming industry is changing.